1. What is the contact information for the HOA and management company? 2. I am not receiving monthly statements, who do I contact? 3. I need to review my account information including balances, where can I find this information? 4. Why should I provide my email to the management company? By having a current email on file, homeowners will receive notices, updates and other HOA information in a timely manner. Additionally, this saves the HOA time and cost from the traditional US Postal letter. You HOA dues can be used for other items. However, there are some notices that by law must be sent via US Post Office. 5. When is trash and recycling pick up? Trash day for the community is on Monday and Thursday and Recycling collection is on Thursdays only. City Ordinance requires that regular trash be set out at the collection point by 7:00 A.M. on the Regular Trash Collection day. City Ordinance also prohibits residents from allowing regular trash bags to be set or left out on days other than designated collection days. Recyclables must be in city provided “blue bags”. Each year 2 rolls of blue bags are provided by the city for free, additional blue bags are available for free at special events or can be purchased from the city. For more information including Holiday schedule or cancellations please visit the City of Richardson Trash Pickup website. If you require a more urgent need to dispose of garbage, please use the north-most dumpster in the apartment complex. See picture below. There is parking all around the community. However there are a few places you cannot park. 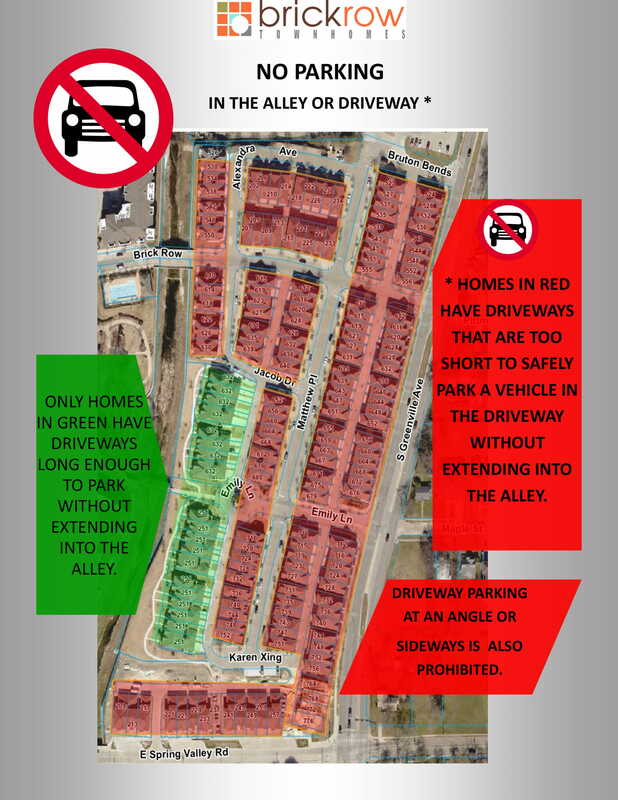 No parking is allowed in the driveways in the alley for most units due to how small the driveways are, even sideways. This is a violation of the HOA rules due to damage it can cause to the exterior and landscaping. See below image for which units can not park in their driveways. 7. 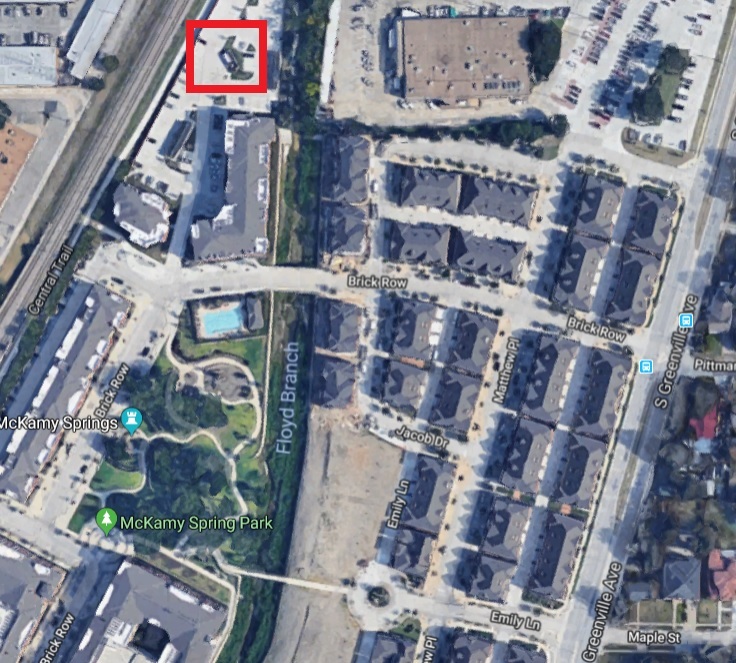 There is a parking space in front of my townhome, is it reserved for my use? There is NO reserved or assigned parking anywhere in the community. Spaces in front of townhomes are on a first come first serve basis. 8. Where can I stay in informed about my community and contact my neighbors? Homeowners are encouraged to create account on RealManage CiraNet portal and Nextdoor.com. Brick Row Townhomes has an exclusive site on Nextdoor. Each member is verified as a resident and profile access information can be limited. 9. What can I do to detour crime and promote safety in my community? Get to know your neighbors, watch for suspicious activity and report it to the authorities. Homeowners are encouraged to have exterior lights on from dusk till dawn. There are several options for automated lighting that homeowners are currently utilizing. 10. Can I plant a vegetable or plant garden in the front/side/back of my home? Gardening is not allowed anywhere around your home. The landscaped and/or green space outside your home and throughout the neighborhood is solely planted and maintained by the landscaping company hired by the HOA to provide a consistent look throughout our neighborhood. 11. Can I make modifications to my front door (storm door, kick plate, etc) or other external portions of my townhome?